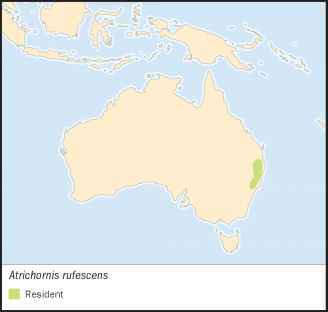 Atrichia rufescens Ramsay, 1866, New South Wales, Australia. Two subspecies recognized. 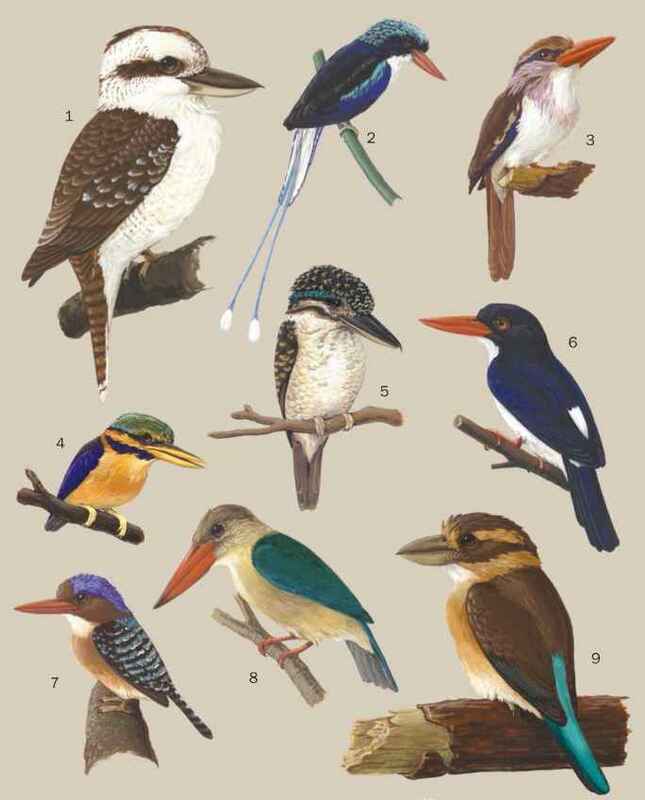 English: Eastern scrub-bird; French: Atrichorne roux; German: Rostbauch-Dickichtvogel; Spanish: Achaparrado Rufa. PHYSICAL CHARACTERISTICS Male 7.1 in (18 cm), female 6.5 in (16.5 cm). Dark rufous-brown with fine black barring above, and buff belly. Male has black mottling on throat and breast. Bill, eyes, and legs dark brown. Patches of dense ground cover within rainforest or adjacent moist eucalyptus forest. Now mainly confined to areas above 1,968 ft (600 m) altitude. Males defend territories using a loud "chipping" song, supplemented by accomplished mimicry of other species, particularly when disturbed. Females much less vocal, producing only soft "ticking" and "squeaking" calls. Feeds on leaf-litter invertebrates obtained by turning leaves with the bill and scratching with strong legs and claws. Breeds September to November. Domed nest constructed mainly of grass, inside completely lined with cardboardlike pulp of wood and grass. Clutch size two, but one egg may be infertile. Listed as Near Threatened. Total population has declined markedly since European settlement, mainly due to habitat loss. Status currently being monitored by annual surveys.